As a child, artist James Palmore had a coterie of siblings and friends and a playground that was as large as his Eastside neighborhood. Eastside artist James Palmore works in many mediums.On the south side of East Main, Palmore says, where he later saw an old map that indicated a former convent stood, there was a wooded area in which pear, apple, and peach trees, as well as blueberries and strawberries still grew, pretty much any child’s survivalist fantasy. When he needed other types of diversion, Palmore says he and his friends would watch the steam locomotives come through and switch directions on a turntable, or take a bike down Motorcycle Hills or pretend to trout fish in a stream near Schippers Lane. Perhaps some seeds of his artistic nature were planted then. But Palmore hesitates to attribute his call to be an artist all to his childhood environment. He also mentions his grandfather who made jewelry out of nails and coins, his father who had a reputation for carving ax handles, older siblings who did “all sorts of crafty things,” his grandfather who was a champion watermelon grower from Hope, Ark., where Palmore was born before the family moved to Kalamazoo in the late 1940s. It would be difficult to find an art venue in Kalamazoo where Palmore does not have a permanent piece, whether a painting or a sculpture, from the Kalamazoo Institute of Arts to Western Michigan University to the Comstock Community Auditorium. In addition, many of his pieces representing African American history can be found at the Douglass Community Association, the Northside Association for Community Development Literacy Pocket Park, and in the Kalamazoo Public Schools, among others. At 75, in what artist Palmore calls his “sunset years,” his “short resume” is three pages long in tiny font and lists awards and honors, individual and group exhibitions since the 1980s to the current year. And Palmore keeps on creating, working most recently on a portrait displayed at the KIA. He plans on working for a long time. As a boy, Palmore loved to take things apart and put them back together again (“I was always curious about how things worked”). He also liked to draw, a talent that was affirmed by his teacher and classmates. “I only did that drawing stuff in school. My parents saw it and kind of appreciated it. But no one ever said, you should be an artist,” he says. And as a teen, he never took an art class, and mostly gave up drawing, though he often worked on theater sets at school. In 1965, at 21, Palmore was drafted at the very beginning of the Vietnam War where he was stationed for two years in Germany as a medic. “I had some free time, so I started drawing. People would say, ‘Can you draw my daughter?’ ‘Can you draw my wife?’ So I did a few of those,” he says. 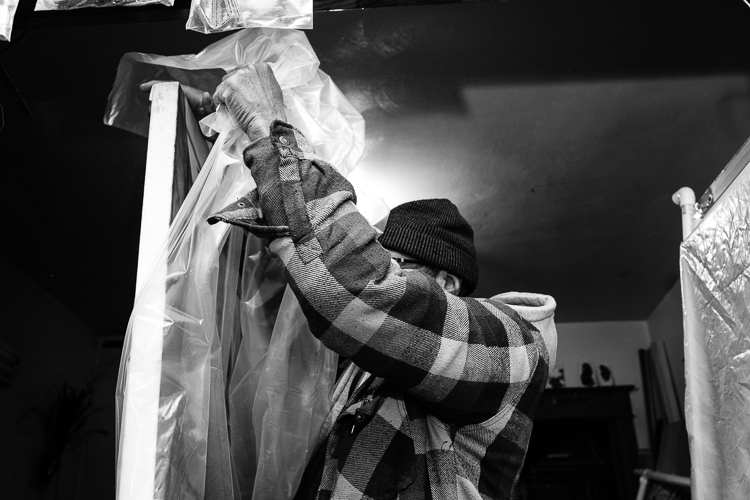 Over time, Palmore began meeting more African American artists in the community, such as Jim Jackson, Jim Maxwell, and Jim Powell, a sign painter who made his living as an artist. Eventually, after watching his mentors and teaching himself, Palmore began entering pieces in the Kalamazoo Institute of Arts shows. “My art world expanded,” he says. Being a developing artist, however, had its struggles. When Palmore discusses the two poles of his vocational world, he puts his arms out wide and weaves back and forth, as though being pulled between two competing calls, teacher and artist. The job Palmore would eventually hold for 25 years as the Youth Program Coordinator at the Kalamazoo Parks & Recreation Department (he retired in 2002) came about because he was applying for a grant-funded job to paint a mural. Afraid the full-time position would detract from his art, at first he didn't apply. But he had some experience working with kids through Powell, who would take Palmore to neighborhoods to do art classes, also through Parks and Rec. “I was always fascinated with kids and how fast they learn, and their purity and innocence,” says Palmore. While all this was occurring, Palmore was also getting more involved with the local arts world. He became a founding board member of the Black Civic Theater, and later, with Bertha Barbee McNeil, a former Velvelette, and Lois Jackson, he helped found the Black Arts and Cultural Center. Palmore’s artistic legacy to Kalamazoo is profound and wide-reaching, and his teaching has left a lasting impression on his many students, whether they were seniors, youth, college students or people with disabilities. 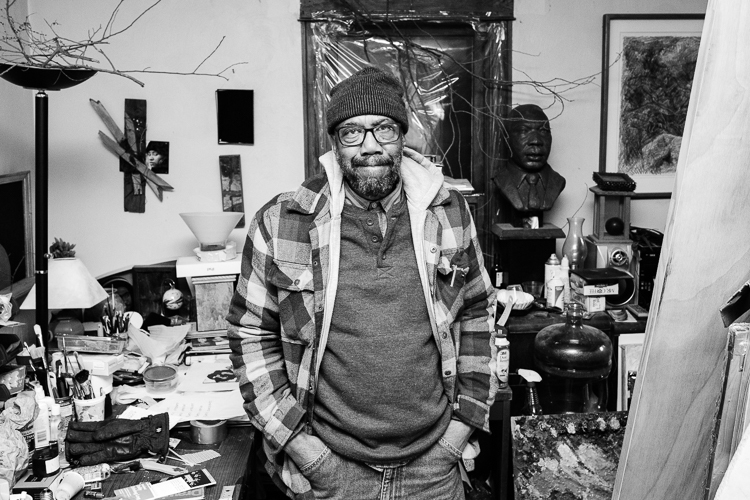 A many of many talents, artist James Palmore works from his studio in his childhood Eastside home. Photo by Eric Hennig“I even once had to teach a class with blind people, and so I had to devise a way to help them learn,” he says. In 1987, for artistic contributions to the area, Palmore was awarded a Community Medal of Arts by the Arts Council of Greater Kalamazoo. He has also received the BACC’s Visionary and Sustaining Recognition Award in 2008, and a Friend of NAMI Award from the National Alliance for the Mentally Ill of Michigan in 2005, among many others. As much as he loves teaching and programming, though, Palmore says he has always felt the tug between those interests and working on his own art. In addition to the inspiration created by his childhood and family, Palmore cites two renowned artists as having inspired him: Rembrandt, a Baroque realist, and Salvador Dali, a surrealist. Palmore also considers himself an abstract surreal artist, like Dali. At 75, Palmore says he can look back at life with a perspective that younger people don’t yet have, especially when it comes to “excavating” aspects of African American history. This view allows him to process political and social events with a wider lens, and provide a “mirror” through his art, he says. A lot can fall under that definition, which is one reason Palmore finds it useful. It’s elastic. “My brother says, ‘You can’t use that definition--it’s too long,’” Palmore says, smiling and shaking his head. “But it’s what I think.